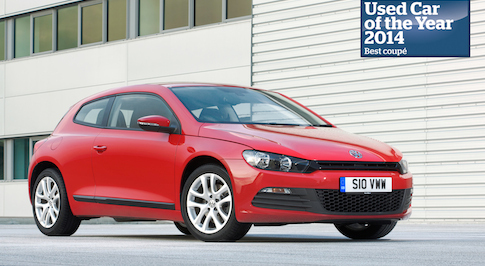 The Volkswagen Scirocco has been named "Best coupé" in What Car? magazine's Used Car of the Year awards. The event, held in London this week, named the best used cars available to buy. The sporty coupé, which went on sale in 2008, came out on top because buyers want something that's stylish and fun to drive. However, it stands out from the rest of the competition in the practicality and reliability stakes. The head turning Scirocco is no stranger to awards, including What Car? 's own "Best Coupé under £25,000" in 2010, and more recently coming fifth overall in the 2014 What Car? JD Power customer satisfaction survey. Commenting on the Scirocco's win, What Car? Editor Jim Holder said: "The Scirocco offers great value for money in a very competitive package. It's good to look at, it's good to drive and it really turns heads. And now the prices have come down it's more appealing than ever." The winning Scirocco was the 2009 model-year 1.4-litre TSI 158bhp model. A choice of engines is available, from a 1.4-litre turbocharged petrol to the hell-raising 261bhp Scirocco R, all with a choice of manual or DSG gearboxes. The latest, freshly revised Volkswagen Scirocco is also now available.